The micro:bit, by itself, offers a vast array of possibilities and potential projects, considering it includes an onboard temperature sensor, accelerometer, compass, LED array, Bluetooth radio, and more. 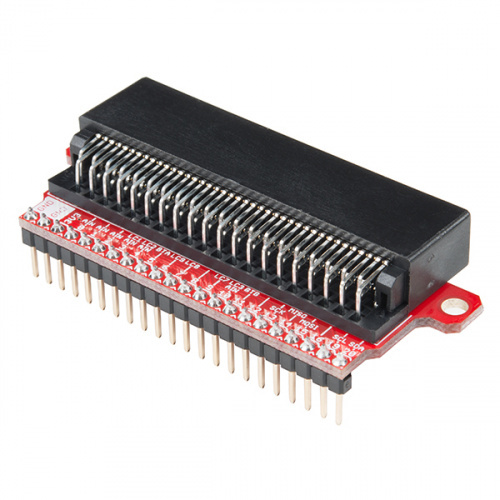 However, when you're ready to branch out beyond those initial capabilities, like connecting to an SD card for logging, you'll need to break out some of the pins on the micro:bit's card edge connector. For that, we've got you covered with the micro:bit Breakout Board. 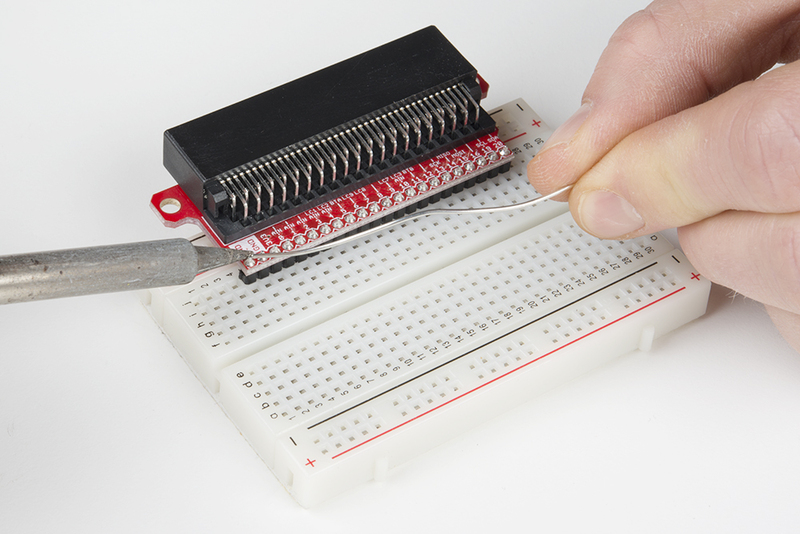 There's also a version without headers, if you care to solder your own or use wires instead. If you have not yet used the micro:bit, check out this guide first. The micro:bit Breakout board allows you to utilize all of the pins on the micro:bit and opens up some previously inaccessible communication ports, like I2C and SPI. Most of the micro:bit's pins can be configured for one or more functions. The pin listed as 3V3 can be used as an input (regulated 3.3V, do not exceed 3.6V!) or an output if you plug a battery pack or USB into the micro:bit. The pins labeled with LCn (e.g. LC1, LC8) refer to pins that are used to control the LED array on the front of the micro:bit. You can use them as GPIO, but you'll often get weird patterns to show up on the LEDs, or when you write to the LED array, you may see unexpected behavior. If you use them as GPIO, we recommend disabling the LED display. If you have the version of the breakout board without headers, solder some breakaway headers to the board. You can also solder wire directly to the breakout. Note: The micro:bit must be facing up in order to make electrical connections to the pins. To begin, let's light up an RGB LED. 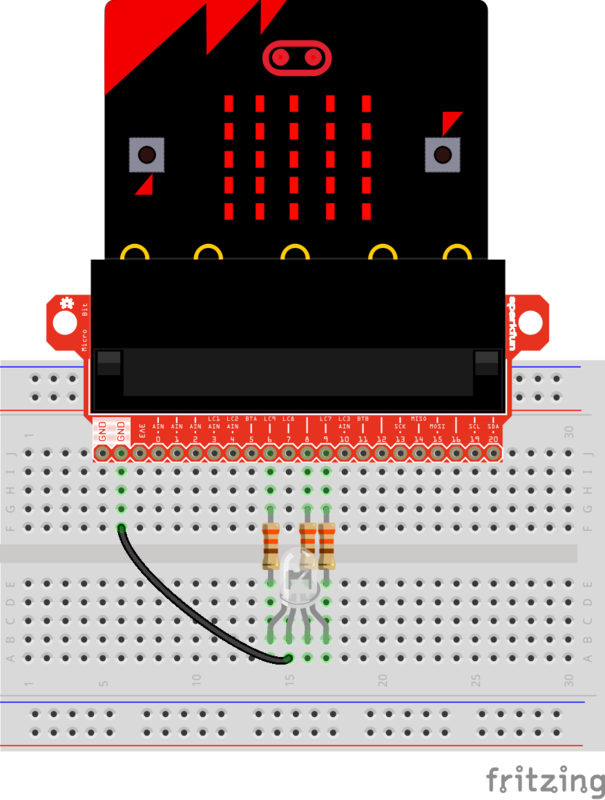 Attach the micro:bit to the breakout board, place the breakout board onto a breadboard, and connect an RGB LED through 330 Ω resistors. Use the image below to aid you in wire up the circuit. Remember, LEDs are polarized parts and can only work properly in one orientation. The longest leg of the LED goes where the black GND wire is in the circuit. Copy the .hex file to your micro:bit drive, and you should see a fancy array of colors appear on your LED! An overview of the flex sensor - a bendable variable resistor. Plus, example circuits and Arduino code to get you started!